Make Your Own Fishing Game - Boston Speech Language Therapy in Brookline, MA 02445. Are you a parent searching for a fun activity to do with your toddler or young child? Are you a speech language pathologist looking for something different to do with your clients? Here’s an activity you can make yourself that children really enjoy. What’s more, the activity can easily be customized to target any child’s speech and language goals. First, cut out fish from different colors of construction paper. The fish should be about 6 inches long and 4 inches wide. Cut out as many as you need – 10 might be a good place to start. You can always cut more if you need them, or you can cut a whole “school” now, using some fish right away for one objective, and saving the rest for other “fishing trips” in the future. Then, measure out 1-2 feet of string. The shorter the string, the easier it will be for the child to “catch” the fish. Tie one end of the string to the wooden dowel, spoon, or stick. Tie the other end of the string to the magnet. Now you’ve made a magnetic fishing rod. - For receptive language goals, such as following simple, two-step directions, write directions on each fish, e.g., “Clap your hands and turn around once.” When the child catches a fish, read the directions to him, so that he can follow the directions and build his receptive language skills. - For expressive language goals, such as asking “Wh-“ questions, write a different “Wh-“ question word on each fish. Each time the child catches a fish, she can ask the featured “Wh-“ question. It may be helpful to first establish a topic with which to frame the questions, e.g., “I did something fun yesterday. Let’s go fishing and you can find out more about it.” Then the child can ask, “What did you do that was fun?” “Where did you do it?” etc. - For social pragmatics goals, such as taking conversational turns, write a topic on each fish, e.g., “Favorite movie,” “What you did after school yesterday,” etc. Then the child and adult (or peers, if working in a group) alternate fishing and asking each other questions about the featured topic, for the requisite number of conversational turns. - For speech production goals, write a different word containing the target sound in the appropriate position (initial, medial, or final) on each fish (e.g., for /s/, you could write or draw “sun,” “dinosaur,” or “bus,” and have the child produce each word 5 times before catching another fish. Alternatively, write a sentence with words containing the target sound on each fish (e.g., “I saw the sun shining on the sea”). - This activity easily lends itself to developing pretend play skills. 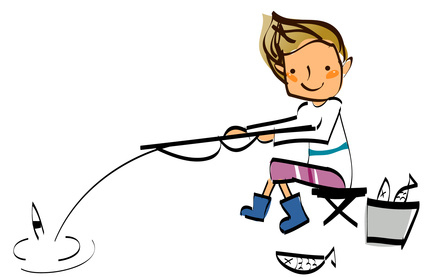 A multi-part schema could be created where the child packs a bag to go on a fishing trip, travels to the river, pretends to put bait on a hook, catches fish, brings the fish home or releases them back into the river, etc. - If you just want to get the child moving – on a day when you’re stuck inside, or for a motor break between table-top activities – write different actions on each fish, e.g., “Jump 10 times,” “Stretch your arms up to the ceiling,” etc. You could even use a fish theme for all of the actions, e.g., “Flop on the floor like a fish,” “Pretend to swim to the other side of the room,” “A shark is chasing you – swim away as fast as you can!” etc. If you have the time and equipment, laminate the fish, and use a dry-erase marker to write the customized items on them. That way you can use the same fish over and over. Finally, tape a paper clip onto each fish. Spread the fish out on the floor, or place them all in a box, or hide them around the room. Have the child catch the fish with the magnetic rod and perform the targeted actions.